New UK Slot Site Jackpot Wish Casino | Win up to 500 Free Spins on Starburst! Jackpot Wish is a brand new destination for all online casino free spins lovers to find incredibly entertaining and rewarding online casino entertainment. Here are more details about the Jackpot Wish online casino site UK. Unlike other online casino sites, here Jackpot Wish offers something unique to players during sign-up process. New players will get a chance to win up to 500 free spins by spinning the Mega Reel after their first deposit. All you have to do is to spin the Mega Reel slots and see how many spins you can win. 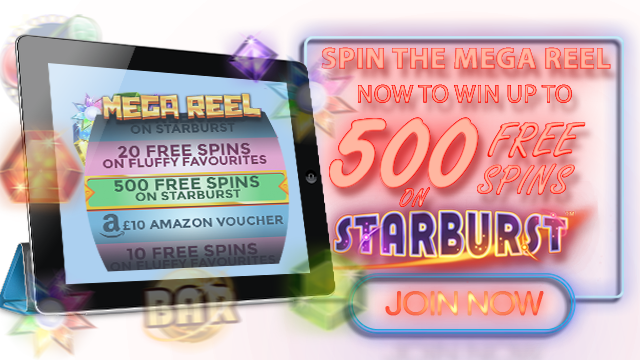 Spins are being offered on one of our best slot games online, Starburst slot. Along with that, players will also win other offers such as 20 free spins on the equally enticing slot game, Fluffy Favourites Slots, gift vouchers for Amazon and more. Also, the site has some exciting offers that players can join in on after signing up. Jackpot Wish truly lives up to it’s name by fulfilling all your wishes. Not only bonuses, but the site also offers highly entertaining online games to play boredom away. Yeah! This is the best bonus deal for any new player right after their first deposit. 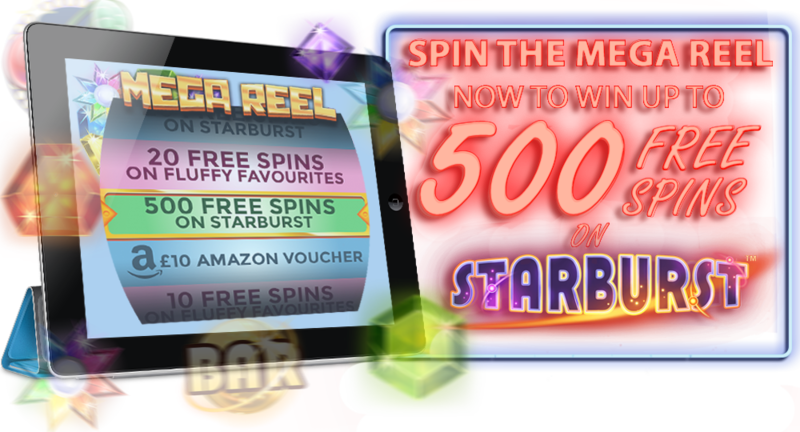 The site offers Spin the Mega Reel Slots for your chance to win amazing prizes including Amazon vouchers, up to 500 Free Spins on Starburst and Fluffy Favourites. Being a product of Jumpman Gaming network, one can get all amazing deals, offers and bonuses offered by the network. Another highlight of the site is it’s lucrative and entertaining range of best online casino games. Players can get their hands on a good number of casino games, slot machines and other equally eye-catching table games. We are constantly updating the site with new slot games and online casino games. We make sure to keep the online gaming entertainment fresh for players. This is the biggest feature to check out at mobile casino sites Jackpot Wish. The site includes super speed mobile gaming interface which helps players to play their favourite games right on a smart phone anywhere and at anytime. The mobile interface is powered by latest technology driven software to ensure seamless mobile gaming experience for players.